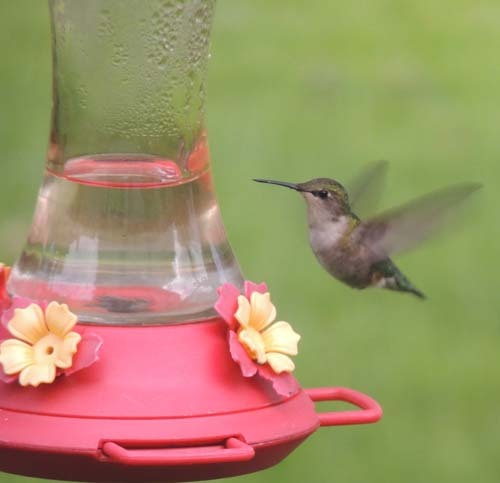 Hummingbirds are perhaps one of the most popular backyard birds. Everybody wants to attract them to their yard. A Hummingbird flaps it's wings 55 time per second! They use a lot of energy and require high energy food. Hummingbirds eat more insects than nectar. Ants are their favorite insect meal. Hummingbird Migrations: Hummingbirds migrate to South and Central America in the Fall of the year. In the spring, they return to North America. Hummingbirds follow long established migration routes. On average, a Hummingbird lives about four years. But, they have been known to live up to 12 years. Gardeners...looking to attract hummingbirds? The best flowers to attract Hummingbirds are red in color, and tubular in shape. Buy these flowers and attract birds to your backyard! Click Here!